So far I still have power (and internet) during Hurricane Sandy. So naturally I'm killing time by watching youtube videos. Just so we're clear, I'm very excited for Skyfall. 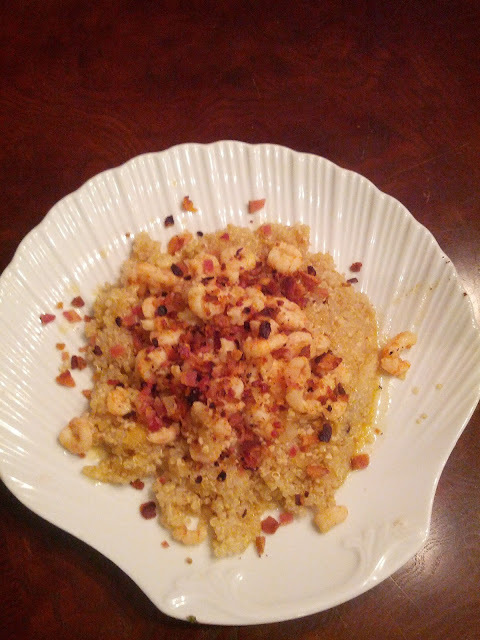 Rock Shrimp with Lemon Quinoa and Bacon. The other night for dinner I made a good cheap meal I thought I'd share. This is really easy and makes enough for about 4 people. chopped garlic (use as much as you want, I tend to use a lot). Some leftover Bacon grease from pre-cooking that bacon. Rinse and drain the shrimp then add some lemon juice. Put it in the fridge for at least an hour or 2. This will partially "cook" the shrimp ceviche style. -add to rice cooker and go. -Just keep an eye on it because quinoa cooks quicker than rice. -Add a splash of lemon juice and a pinch of salt/pepper near the end of the cooking time. -Take a tablespoon or so of the bacon grease add to a small saucepan, then coat the rest of the bottom in olive oil. -once it starts to saute you can add a splash of lemon juice, pinch of paprika and a splash of white wine. Congratulations to Felix Baumgartner for making history. The Austrian Skydiver/Daredevil has successfully jumped from a suspended capsule on the edge of space, breaking the speed of sound on the way down to land safely 9 minutes later. "When I was standing there on top of the world, you become so humble, you do not think about breaking records anymore, you do not think about gaining scientific data," Baumgartner said after the jump. "The only thing you want is to come back alive." It was part scientific wonder, part daredevil reality show, with the live-streamed event instantly capturing the world's attention on a sleepy Sunday at the same time seven NFL football games were being played. It proved, once again, the power of the Internet in a world where news travels as fast as Twitter. More than 130 digital outlets carried the live feed, organizers said. Want to see a tire exploding in super slow motion?